Former UFC heavyweight champion Brock Lesnar is on the sidelines again with another bout with diverticulitis. UFC president Dana White announced the news in a special announcement on Thursday afternoon. That means not only is he out of the proposed fight with Junior dos Santos at UFC 131 in Vancouver, but he also has to make some decisions about his future in the sport. “Brock spent all day yesterday at the Mayo Clinic,” said White. “He’s got some choices to make in a couple of weeks, whether to fight this thing and continue fighting or not. 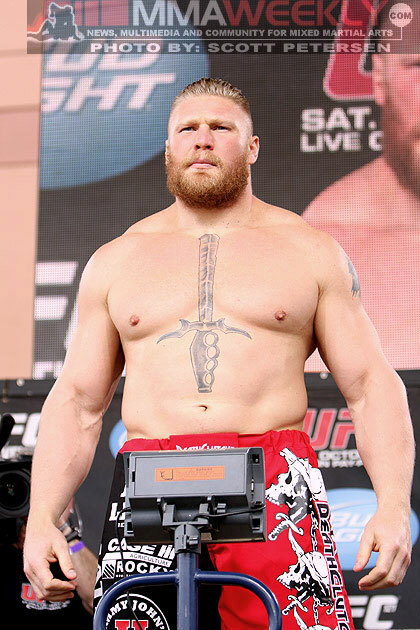 Lesnar, however, has already made one decision, despite what White says. “This isn’t the end of my fight career. I believe there’s a solution to every problem,” Lesnar stated. “I just have to find the right solution to fix this problem.